Become the best of the best in an instant when you throw these Combat Hero Medals on your uniform! If you really want to show your appreciation for the men and women that keep this country safe, the most sincere form of flattery is imitation! 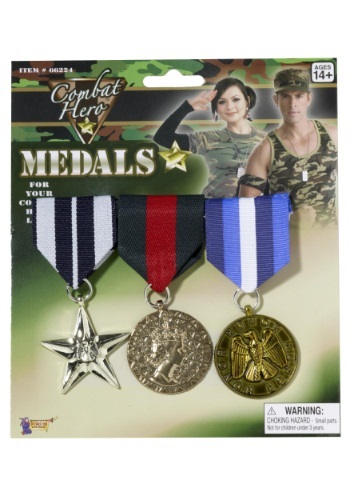 So grab yourself a military costume, strap up those boots, and pin this collection of medals to your chest. You'll look just like America's greatest heroes so make sure you have a story or two to tell those who are curious about your medals. Sure you could watch a few war movies or a handful of G.I. Joe episodes, but why not honor some actual veterans. You could take time to listen to a few stories about their own time spent in war. Then rather than taking any glory for yourself, tell others about the accomplishments of these real-life heroes. Although do try and remember you're not in a war zone but rather a party zone, so at ease soldier! Show these civilians that the military still knows how to get down and have a good time!